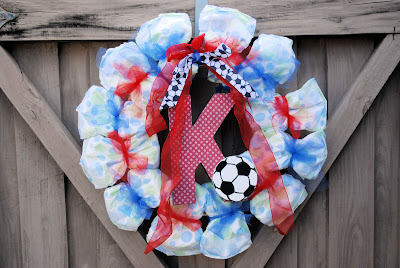 Diaper Wreaths are a great, easy alternative to the diaper cake. They are much less intimidating for the beginner to make. They are the perfect baby shower gift or to bring to the hospital for baby's arrival. Be sure to include a wreath hanger for Mom to use to hang the wreath on baby's door when they get home. The supplies you will need include diapers, a wreath form, ribbon, tulle and a variety of decorations. (Be sure to let mom know what size the diapers are.) For the letter you will need a cardboard letter, spray paint, mod podge, and scrapbook paper. 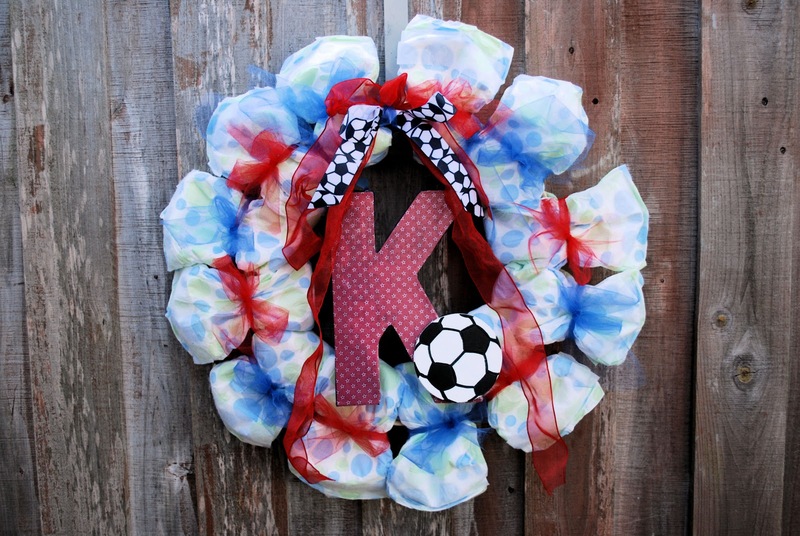 These wreaths are so easy to customize for any theme. There are a variety of wreath forms you can use. I have used a metal one in the past and used a grapevine one for this wreath. There are also wood and styrofoam forms. Begin by opening up a diaper, putting it around the edge and then closing it again around the form. You can use small rubber bands to keep it in place or just tie ribbon around it. I used tulle cut into short strips. Continue this around the whole wreath, keeping the diapers pushed close together so the form does not show. Next it's time to add the decorations. If you have a lot of small items like socks, nail clippers, travel baby wash, washcloths, even onesies, you can actually put them on the wreath tied in place with your ribbons. I chose to go with a more simple look so that it could hang on the baby's door without having to disassemble it until they were ready to use the diapers. I found a cardboard letter K to use for my decoration since Mom has already decided on baby's name. You could also use a stuffed animal, a large rubber ducky, or a large bow. I spray painted the outside edge of my letter. After it was dry, I traced the letter onto the back of my patterned scrapbook paper. Make sure the front of your letter is facing down onto the back of the paper when you trace it. ﻿Apply Mod Podge onto the front of your letter and the back of your paper. Place the paper onto the letter and smooth out any bubbles. Allow to dry completely. Apply another coat of mod podge on top of the paper. Allow to dry completely. Apply two more coats on top, allowing to dry completely between each coat. I added a wooden soccer ball from the craft store. Use hot glue to attach. Hot glue ribbon to the back of the letter so that you can tie it to the wreath. Later, Mom can hang the letter on the wall of the baby's room. Add any extra bows or decorations you would like and the wreath is ready to hang. Thanks so much! Glad you liked it. so stinkin' cute!! lovin' this blog!! I am not sure how you find the time to do all this awesome stuff but keep it up!! Thanks so much for your sweet comment! It definitely keeps me busy, but I love doing it!